How many trumpets do you play? Two of each of the following trumpets: Bb, C, D, Piccolo. 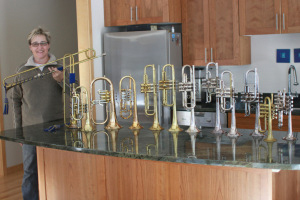 One of each of the following: Eb trumpet, Flugelhorn, Bb Cornet. The SPCO owns the rotary trumpets that we use, as well as the set of natural trumpets. In addition to having a variety of trumpets, I also have to have a large number of mutes. Each mute has a different timbre, and it’s nice to have a large selection so you can get the exact sound that you want. I also use a number of different mouthpieces: slightly smaller and shallower mouthpiece for the high piccolo trumpet, and a larger, deeper mouthpiece for most of the playing I do in the orchestra. Trumpets, mouthpieces and mutes are tools, and as players, we need to determine which tools are best for the piece of music at hand. The repertoire we play in the SPCO requires the trumpet players to be able to play on a number of different trumpets pitched in different keys. In addition to modern piston trumpets, we also play rotary trumpets and natural trumpets (trumpets that have no valves at all).